Asha was just like any other 24 year old, average looking, hard working Indian girl. She had no siblings, her parents were over protective, but she didn't complain instead she enjoyed spending her entire time with them. She was always obedient and never did anything without her parents consent, but today all hell broke loose when she announced "I am going to visit Malaysia". Her parents looked at her in a state of shock. 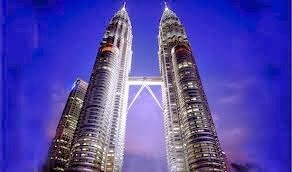 She continued "I have always dreamed of traveling alone and visiting the city of my dreams, Malaysia. First of all, its a safe country for women travelers. Its just 4hours flight journey from Bangalore, and affordable too. I could use a part of my savings. I always wanted to visit this place which is filled with fun, excitement, thrill, nature, beaches, rich heritage and beautiful culture. So please mom dad, let me have this first and last adventure of my life. I request you to give me permission to visit this beautiful country on my own." Her parents could not refuse their daughter's sincere request, after all it was the first time Asha had ever asked for something. After a lengthy discussion and sharing of all details finally her parents agreed. The moment Asha got her parents approval she thanked them and started jumping around in excitement. For the next few hours her eyes were glued on the official website of Tourism Malaysia. She was lost seeing 268 cultural attractions, different events and festivals, 144 city excitement points, hundreds of islands, blue breathtaking beaches, she had still not checked the Nature and adventure section which also had plenty of options. She was overwhelmed, Malaysia had a lot more to offer, than she knew. She felt 7 days might just not be enough, but that was a constraint and she had to keep up with it. After spending 3 days on Tourism Malaysia website, which offered her all the information starting from flights, trip advisory and accomodation,this site just made her planning so much easier. 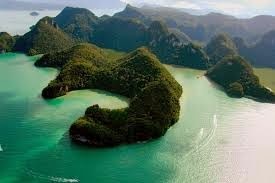 Asha could finally select her favorite attractions and creates a itinerary "The must see places in Malaysia for Asha". She thought 21st March friday would be perfect to travel. She booked her flight which was scheduled to reach Malaysia At 1pm afternoon. She had heard so much about Malaysia's huge International airport so she knew for sure she needed time to look around. Asha thought this was the best way to start her journey by seeking God's Blessings and visiting the rare cave temples. 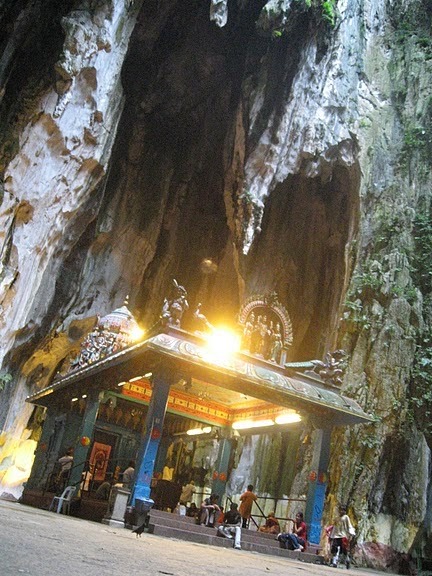 Batu Caves is a limestone hill that has a series of caves and cave temples in the Gombak district, 13 kilometers north of Kuala Lumpur. 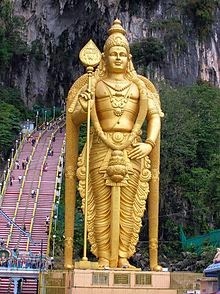 Rising almost 100m above the ground, the Batu Caves temple complex consists of three main caves and a few smaller ones. The biggest, referred to as Cathedral Cave or Temple Cave, has a very high ceiling and features ornate Hindu shrines. To reach it, visitors must climb a steep flight of 272 steps. At the base of the hill are two more cave temples, Art Gallery Cave and Museum Cave, both of which are full of Hindu statues and paintings. This complex was renovated and opened as the Cave Villa in 2008. Many of the shrines relate the story of Lord Murugan's victory over the demon Soorapadam. An audio tour is available to visitors. Asha was a planner so she also jot down an nearby location, just in case she had time she could take a sneak peek there, thus Nearby Quick Visits section was added to her itinerary. Day 2: 23rd March Sunday: Dayang Bunting Lake/ 'Tasik Dayang Bunting', Langkawi, Kedah. Asha wanted to see this lake exactly the way it looked in the pictures so she booked for an helicopter ride which would give her a grand tour of the beautiful lake and surrounding Kedah. The island, which is about 20 kilometers from Kuah town, is modestly populated on one side and virtually uninhabited on the other where the lake is situated. 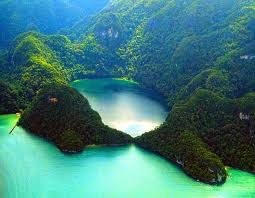 Asha was touched by The legend of Tasik Dayang Bunting, which goes like this: The favorite bathing pool of a celestial princess named Mambang Sari was said to be Tasik Dayang Bunting (Lake of the Pregnant Maiden). A prince, Mat Teja, fell madly in love with her and tricked her into marrying him. Asha was keen on knowing more about Malyasia's culture, so the third day was dedicated to it. 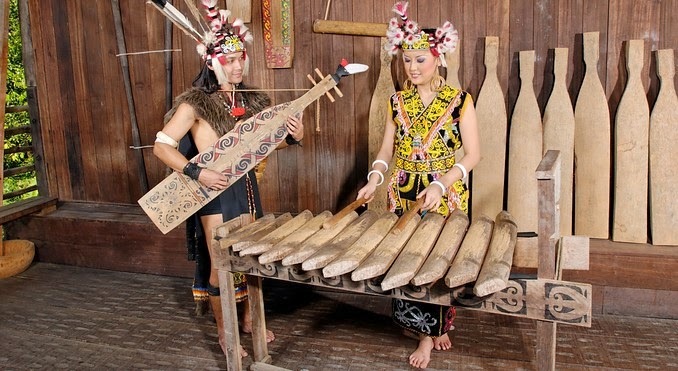 Sarawak Cultural Village, Known as the 'Living Museum', the Cultural Village was set up to preserve and showcase Sarawak's cultural heritage. Located at Pantai Damai, Santubong, just 32km from the state capital, Kuching, it is the perfect place to get introduced to local culture and lifestyle. Sprawled across 17 acres, there are about 150 people living in the village, demonstrating traditional daily activities from Sarawak's diverse tribes like the processing of sago and the making of handicrafts. They wear traditional costumes and also put on dances for visitors. Asha loved heights, so the tall twins are a must visit for her. Towering at 451.9m above street level, this world-renowned icon is currently the world's tallest twin structure and fifth tallest skyscraper. The skybridge that links the two towers is also the world's highest two-story bridge, doubling up as a superb viewing platform. The 88-storey building features glass and steel on the outside, and a traditionally-inspired interior, reflecting Malaysia's aspirations in moving forward while maintaining its national identity. 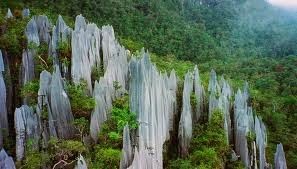 Day 5: March Wednesday: Gunung Mulu National Park. Asha believed in Albert Einstein's quote "Look deep into nature, then you will understand everything better".For a nature lover visiting Gunung Mulu, was no less than a treat. 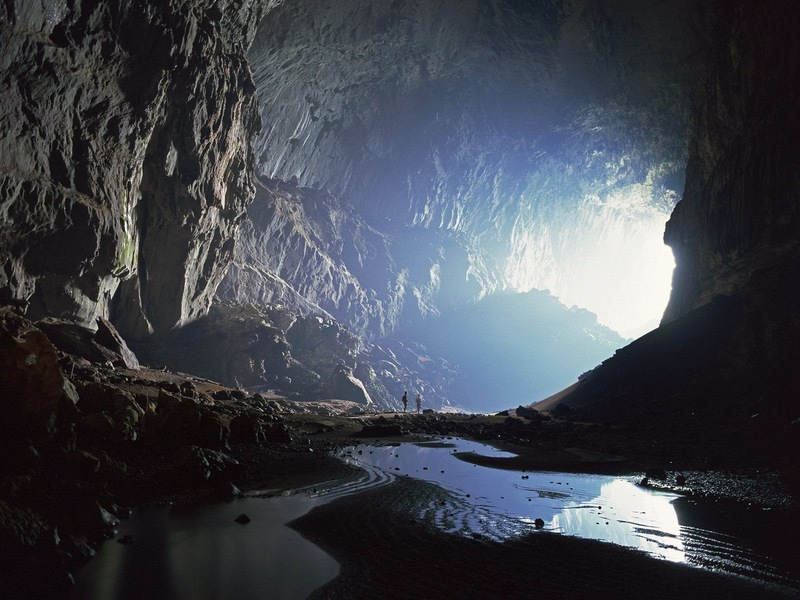 Mulu Caves National Park is home to one of the longest networks of caves in the world. Here lies the worlds largest underground chamber, the Sarawak Chamber, capable of accommodating forty Boeing 747 airplanes. In Mulu, you will also find one of the worlds biggest cave passage, Deer Cave, which can fit five cathedrals the size of Saint Pauls in London. Another key attraction is Clear Water Cave, the longest cave in Southeast Asia. The massive caves here are home to millions of bats and cave swiftlets that swarm out into the jungle in great clouds every evening at dusk! Five fun filled days come to an end and for the last day, the day of departure 26th March, Asha scheduled her flight at 4pm, so that she had plenty of time to shop souvenirs for her family and friends. I am participating in the MalaysiaJao Blogathon Contest in association with BlogAdda.com. I have actually Won THIS CONTEST ! SO Happy and excited to be visiting Malaysia SOON ! You have put lots of work to it, ananya, congrats!! Nice write-up!! You have put in a lot on this post, and it shows. If you could narrate so well even before visiting, then how much lovelier your post would be after you come back. Do write another too after visiting. Nice writeup Ananya.. Asha plaaned everything in detail :) All the best for the contest! Nice post.. All the best dear!! Ananya you have a brilliant blog here - I have my task cut out over the weekend to go thru' every single post! Thanks for visiting my blog and all the best for the Malaysian trip contest! Congrats!! Your beautiful post has made it!! At first when I read you comments I didnt believe it !